I thought they were so cute, so I made my own version almost two years ago when my oldest got her little kitchen for Christmas. 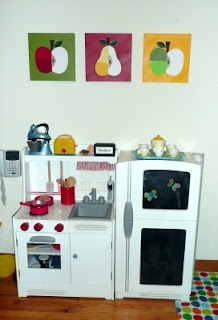 They hang on the wall in the playroom over the kitchen set (which actually did come from Land of Nod). Sorry I don't have any process pictures, but I wasn't blogging back when I made these. Here's a quick rundown of how I made them. I bought three 12" square canvases and painted them each a different color. 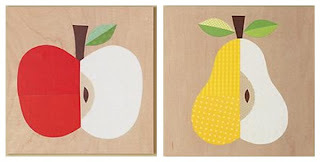 I then drew an apple and a pear, cut them into the different pieces that I wanted, and used those pieces as templates to trace and cut out the different scrapbook papers that I used. 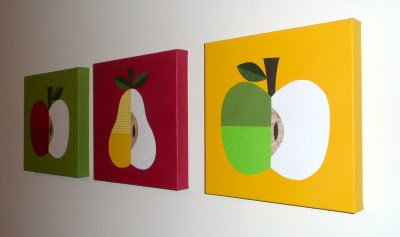 Then all you do is mod podge them onto the canvases... super simple! I'm linking this up over at the Round 1 Brand Inspired/Knockoff Link-Up at Sew Dang Cute! Go get inspired by some of the other knock-offs! That is an incredible knockoff. Love it with the play kitchen! Seriously, I would not have guessed that these were knockoffs...great job! 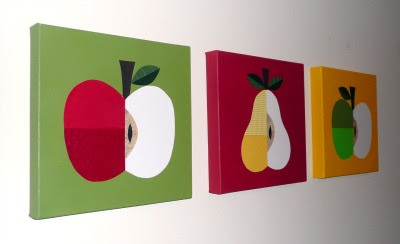 I think I love anything fruit-themed and these are so clean and simple...maybe I'll give Mod Podge a try yet! Those are better than the originals! Awesome! I love Land of Nod...except for the pricetags. I would never have known that these were homemade, they look so clean and professional and perfect! Beautiful! So, so adorable! As you create my pinwheel lollies, I'll create your beautiful wall art. 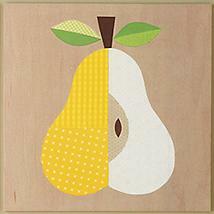 Can't wait to add that splash of colour to the playroom! These are phenomenal! I like them heaps better than the Land of Nod ones. I'd love for any tips you might have to share about how they were made. These are really great Gwen! I love the colors! I saw those in the catalog too- I love how much more color yours have! Here from Paisley Passion - wow, I LOVE this knockoff! They look really professional and perfect over the kitchen set! Absolutely adorable! And just perfect over the play kitchen - LOVE! These are just too cute! 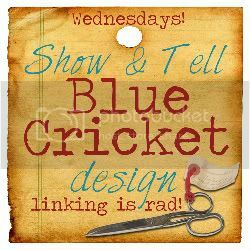 I am featuring them over at my blog so head on over and grab a featured button if you'd like...thanks for linking these up! Those are so cute! Thanks so much for the idea! I will def try to do something like this soon!